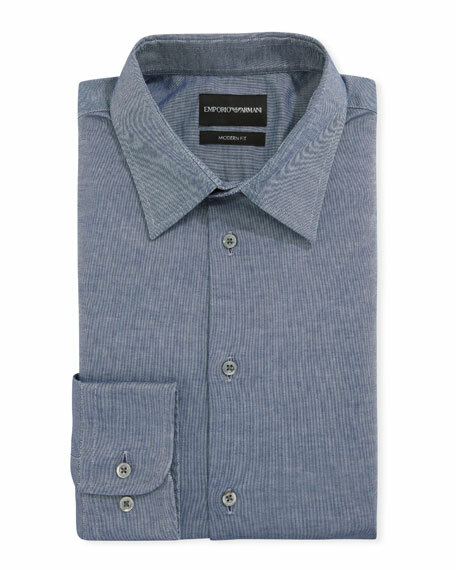 Emporio Armani dress shirt in chambray weave. Point collar; mother-of-pearl button front. Emporio Armani sport shirt in chevron-print. Spread collar; button front. Rounded barrel cuffs. Shirttail hem. Cotton. Imported. Model's measurements: Height 6'1"/185cm, waist 32"/81cm, typically wears size M.
Emporio Armani diamond-pattern flocked woven shirt. Spread collar; button front. Long sleeves; button cuffs. Classic fit. Yoked back. Shirttail hem. Emporio Armani diamond-pattern flocked woven shirt. Spread collar; button front. Long sleeves; button cuffs. Classic fit. Yoked back. Shirttail hem. Cotton. Imported. Emporio Armani sport shirt in hexagon pattern. Spread collar; button front. Rounded barrel cuffs. Shirttail hem. Cotton. Imported. Model's measurements: Height 6'1"/185cm, waist 32"/81cm, typically wears size M.
Emporio Armani polo shirt in horizontal stripes. Spread collar; button placket. Straight hem. Pullover style. Cotton. Made in Bulgaria.